You may wonder how trees can impact the lives of children. Even 1,000 trees ... or more. We can't wait to tell you! There is a children's home in Honduras that houses almost 40 children who have been orphaned, abused, or abandoned. They are not up for adoption - they have found their permanent home and their new family. The two women who founded this home and lead it have a deep faith in God, and they have a genuine love for each of these children. They are family. As beautiful as this is, it doesn't pay the bills. There are many costs associated with caring for this big extended family - food, clothing, school uniforms, medical treatment, supplies, and day to day living costs. TerraMica has partnered with this home for a long term commitment. Why? We believe that true religion, true faith is exercised in caring for the needs of orphans and widows. And, quite honestly, they have won our hearts. Our first step was to establish a bi-annual dental clinic, and we recently completed the second one a few months ago. These children, ranging in age from 1 to 18, had previously never been seen by a dentist! Working with a dental brigade in Honduras, we have now funded and administrated two dental clinics for these children. But that still doesn't answer the questions about the TREES .... read on! 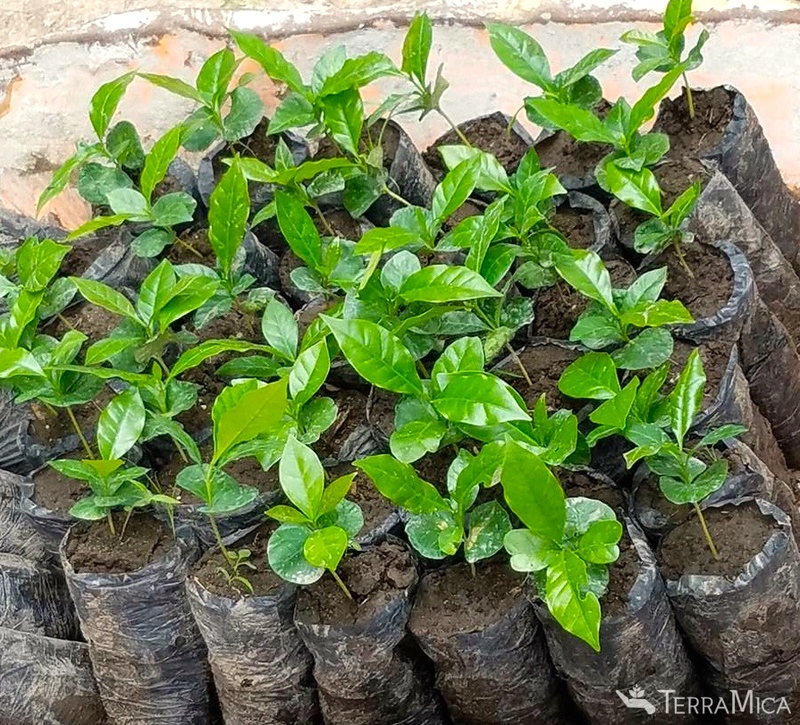 TerraMica purchased 1,080 coffee trees to plant on the property of the children's home. In three years, these coffee trees will produce between 15,000 and 20,000 pounds of coffee cherries, or about 4,000 pounds of green coffee per year. The coffee will then be sold to an exporter - and so the children's home will receive a substantial income boost which will provide for much needed food, clothing, and medical supplies! Special thanks to our "Tree Team" for getting the property cleared and trees in the ground! How do you plant 1,000+ trees in just a few days? Volunteers!!! 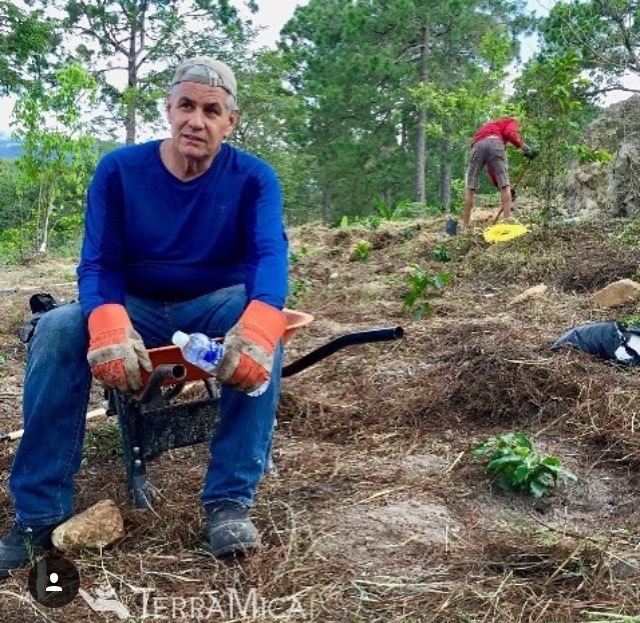 TerraMica had an amazing Tree Team devoted to this project. Along with TM staffers, we had two volunteers from southern California with hearts to serve, the grounds-keeper, and a group of boys from the children's home. Yep, we got it done! The passion and heart that these servants brought with them made this project come to fruition! Special thanks to our Tree Team: volunteers Ed Orem and Steve Dixon, staffers Jorge Sosa and Ed Apffel, Gabriel the home grounds-keeper, and the group of boys from the home who were willing to serve, work hard, and, yes, get dirty! Because of their teamwork and efforts, all the trees were planted! In addition, one afternoon when one of our team members was ill and we were wondering how all the trees would get planted, we were surprised by the arrival of a bus at the home. A group of people from Hearts 4 Honduras based in Chicago, IL arrived with plans to visit the children. However, most of the kids who weren't on the Tree Team had left the grounds for youth camp. These folks asked what we were doing, and then a group of them volunteered to help! You just don't expect a bus full of Americans to pull up to a children's home in an outlying areas of Honduras and partner with you .... so, one afternoon we were surprised by the blessing of additional hearts and hands that contributed to our project! children, working together. What's the goal? Improved sustenance and sustainability for these kids and their home! How will we create greater sustainability for the home? The dental clinics and the trees we planted are a great start. In the next phase, we will be building chicken coops and providing chickens - half for protein to feed the children, half for egg laying, which will provide food as well as additional income when extra eggs are sold at market. In 2017, we'll be developing the strategy for the next phases of developing sustainability. Not only are we focused on helping this children's home, we're excited about helping them to become self-sustaining!